The genus contains a single species. Mesonychoteuthis hamiltoni is the largest of all cranchiid species with adults reaching over 2 m in mantle length (Nesis, 1982). 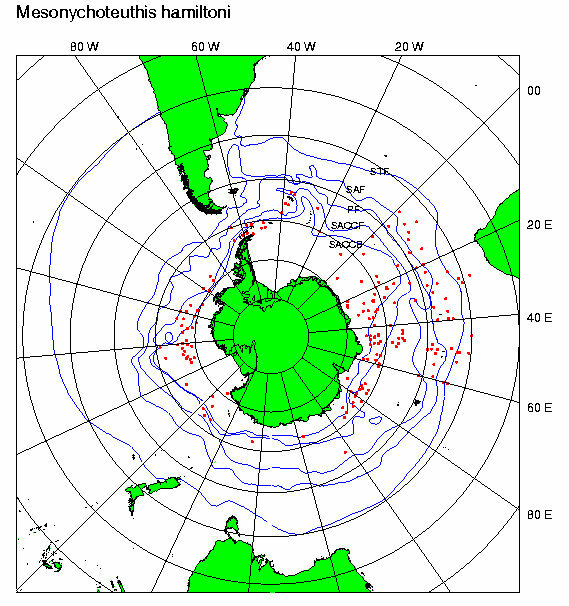 It is a circumpolar Antarctic species with young found north to the subtropical convergence (Nesis, 1982). A video of this squid can be seen here. with hooks on the arms and tentacle clubs. Figure. Oral view of half of the arm crown (arms I-IV, arm I at top) of a juvenile M. hamiltoni, 86 mm ML. Drawing from Voss (1980), p. 395. Figure. Dorsal view of the brachial crown of a large M. hamiltoni. Photograph by Martin Collins. Diagonally set pairs of suckers and pads on distal 2/3 of tentacular stalk. Figure. 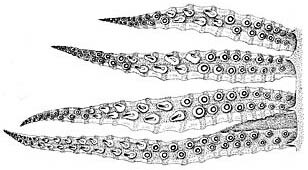 Oral view of the tentacular club of a large M. hamiltoni. Note the very small marginal suckers. Photograph by Martin Collins. Funnel organ: Dorsal pad with three papillae. Tubercles absent in adults, present in paralarvae and juveniles. Fins ovate, without anterior lobes. Two ocular photophores: crescent-shaped photogenic region in medial photophore and small, oblong photogenic region in lateral photophore within concavity of first. Arm tip photophores probably absent. This is the only cranchiid that has hooks on the arms. Characteristics are from Voss (1980). The young stages were described by McSweeny (1970). Hooks first appear on the arms at about 45 mm ML. Figure. Top - Dorsal view of an advanced paralarva of M. hamiltoni, 23 mm ML. Bottom - Ventral view of a juvenile of M. hamiltoni, 86 mm ML. Drawings from Voss (1980, p. 395, fig. 10 c, b). M. hamiltoni is known only from Antarctic waters. A map of its distribution can be found here. McSweeny, E. S. 1970. Description of the juvenile form of the Antarctic squid Mesonychoteuthis hamiltoni Robson. Malacologia, 10(2): 323-332.
modified from Voss, N. A. 1980. A generic revision of the Cranchiidae (Cephalopoda; Oegopsida). Bull. Mar. Sci. 30:365-412. Steve O'Shea is standing next to the squid. Arrow marks anterior edge of mantle. Page: Tree of Life Mesonychoteuthis Robson, 1925. Mesonychoteuthis hamiltoni Robson, 1925. Colossal Squid. Authored by Richard E. Young and Katharina M. Mangold (1922-2003). The TEXT of this page is licensed under the Creative Commons Attribution-NonCommercial License - Version 3.0. Note that images and other media featured on this page are each governed by their own license, and they may or may not be available for reuse. Click on an image or a media link to access the media data window, which provides the relevant licensing information. For the general terms and conditions of ToL material reuse and redistribution, please see the Tree of Life Copyright Policies.